I was curious about the speed of j2me on different phones so I wrote this. This is one of my favorite ways to benchmark a computer. 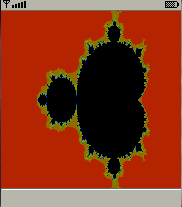 If you'd like to read about Mandelbrots, I recommend you read my explanation on my Mandelbrot Client/Server page. This program is pretty much useless to most people, it's just more of a fun thing I made for myself. In other words, if you don't know what a Mandelbrot is, don't bother to download this :). Note: This program does not work on phones that support CLDC 1.0. CLDC 1.0 will not do floating point math (it won't work on my SonyEricsson T610). If you have experiences on similar phones, let me know. To exit this application, you may have to hold down the back button on your phone. To use: You can navigate around the Mandelbrot formula by using either the build in joystick/gamepad like thingie that most modern phones have, or you can use the numbers 8 for down, 4 for left, 2 for up, and 6 to move to the right. Pressing in on the joystick or pressing the number 5 will zoom in on the picture/formula.